Brad Marchand tips a pass home late in the first OT session as Boston wins the second-round opener. 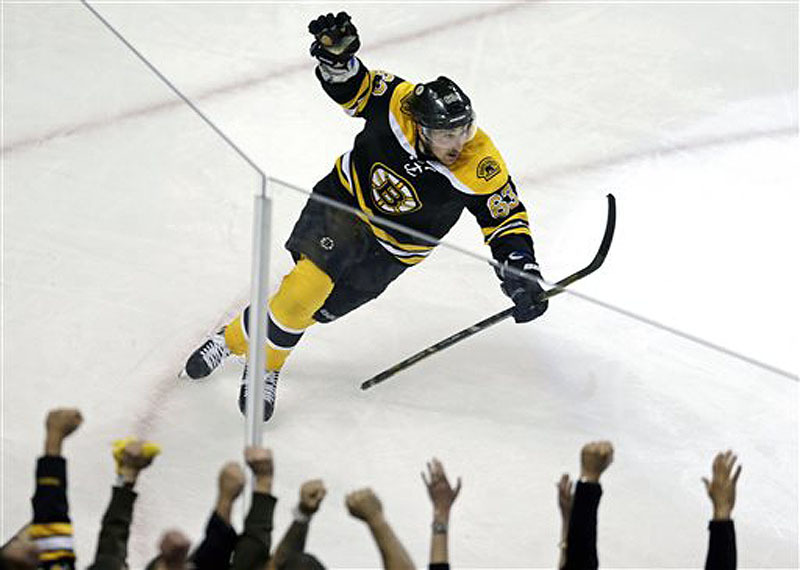 BOSTON – Brad Marchand scored with 4:20 left in the first overtime and the Boston Bruins beat the New York Rangers 3-2 in the first playoff game in 40 years between the Original Six teams. Marchand, Boston’s top goal scorer in the regular season, got his first of the postseason on a pass from Patrice Bergeron. Marchand had carried the puck up the right side, passed it to Bergeron and kept going toward the net. Bergeron passed across the slot and Marchand tipped it past goalie Henrik Lundqvist from the left side of the crease. The Bruins carried the play throughout overtime. They applied constant pressure, but couldn’t score during a power play when Derek Dorsett was penalized for interference at 2:20 of overtime. Boston nearly won in regulation, but Johnny Boychuk’s shot from the right point clanged off the left post with one-tenth of a second remaining. Then he hit the left post at the other end of the ice at 6:34 of overtime. Defenseman Zdeno Chara gave Boston a 1-0 lead at 12:23 of the second before Ryan McDonagh tied it with just 1.3 seconds left in the period, taking advantage of a defensive lapse in the Bruins end. Derek Stepan put the Rangers ahead 2-1 just 14 seconds into the third period, but Torey Krug — an emergency call-up from Providence playing in his first Stanley Cup playoff game — tied it on a power play with his first NHL goal. The 22-year-old Krug, a former Michigan State Spartan, did play three regular-season games for Boston the past two seasons. Game 2 of the best-of-seven Eastern Conference semifinals is set for Sunday night in Boston. The winner will play the winner of the Pittsburgh-Ottawa series, which the Penguins lead 1-0. The second game of that series is Friday in Pittsburgh. 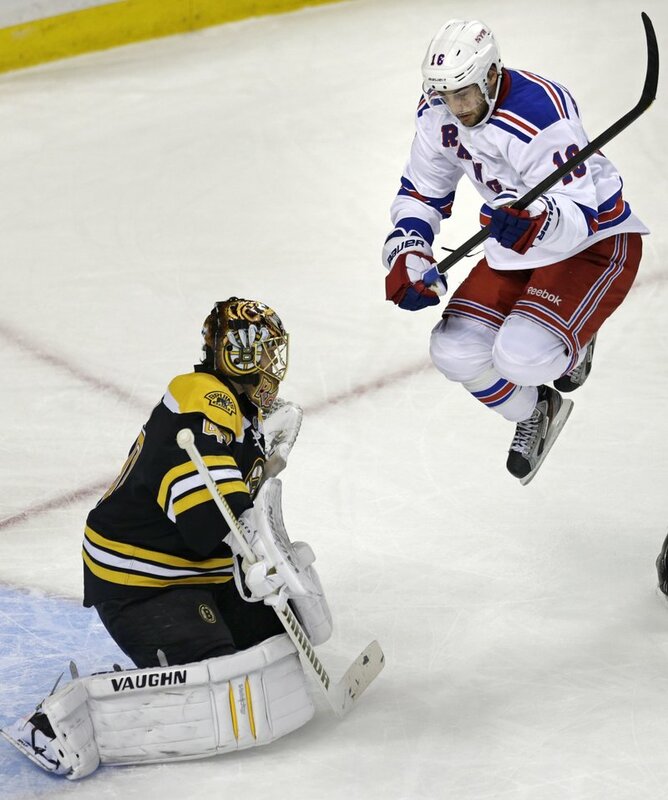 Both the Bruins and Rangers advanced with Game 7 victories Monday night. The Bruins overcame a three-goal deficit with less than 11 minutes left in regulation and beat the Toronto Maple Leafs 5-4 on Bergeron’s goal in overtime. The Rangers beat the Washington Capitals 5-0 behind Lundqvist’s second consecutive shutout, winning four of the last five games after dropping the first two contests. On Thursday, the Bruins played without three injured veteran defensemen: Andrew Ference, Dennis Seidenberg and Wade Redden. In addition to Krug, two other rookies started on the blue line: Dougie Hamilton and Matt Bartkowski. Lundqvist had blanked the Capitals in the sixth and seventh games, but the Bruins finally ended the goalie’s shutout streak at 152 minutes, 23 seconds on a soft goal by Chara. Lundqvist appeared to have a good view of the 50-foot slap shot from just in front of the middle of the blue line and got a piece of the puck, but it still trickled by him. That lead nearly held up through the second period. But when Boychuk passed the puck from in front of his net to teammate Tyler Seguin in the right circle, Rick Nash hit Sequin’s stick and the puck went to McDonagh at the left point. McDonagh’s rising slap shot soared over the right arm of goaltender Tuukka Rask. Stepan then made it 2-1 on a 30-foot shot from the slot through Rask’s legs, two goals in 15.3 seconds. But Rask settled down afterward, holding the Rangers scoreless the rest of the way. Krug tied the game with teammate David Krejci in front of the net trying to screen Lundqvist. The shot from just inside the top of the left circle went under Lundqvist’s left arm. NOTES: Stepan’s goal was the sixth against the Bruins in the first two minutes of a period in their eight playoff games. … The teams last met in the playoffs in 1973 when the Rangers won the first-round series in five games. The previous year, they faced each other in the Stanley Cup finals, and the Bruins won in six, led by Bobby Orr and Gerry Cheevers. … Both teams’ leading goal scorers in the regular season had no goals in eight playoff games heading in. New York’s Rick Nash stretched that unwanted string to nine, but Marchand’s goal won the game. … Boston’s Jaromir Jagr, a former Ranger, is the only player on either team who had been born the last time the teams met in the playoffs on April 10, 1973. Jagr also has played for Pittsburgh, Washington, Philadelphia and Dallas as well as several teams overseas.